Posted July 22, 2016, 7:53 a.m.
On the Fourth of July, before the nation was transfixed by graphic footage of police killing Alton Sterling in Louisiana and Philando Castile in Minnesota, before five law enforcement officers were killed in an ambush in Dallas, Los Angeles County Sheriff’s Det. Phil Martinez found himself squinting at the sky at the scene of one of five homicides in the county that day. That week, from July 3 to 9, 19 people were killed in L.A. County. Twelve is the weekly average this year, according to the county coroner’s office. The weekly high, in February, was 25. The low was seven, one week in January and one in April. Most of the dead in the first full week of July were black or Latino men killed by gunfire. Two of the people were shot by police. Overwhelmingly, the 19 killings occurred in areas south of the 10 Freeway and east of the 405. And none of the 19 garnered the level of attention of those in Louisiana, Minnesota and Texas. Alfredo Esparza said his family had long worried about his older brother Gilbert Esparza, who was fatally shot in the early hours of July 9 while riding his bike on an unlit trail along the Los Angeles River in Bell. “I feel like people don’t realize it is dangerous out there, and people can get hurt for any reason,” Alfredo Esparza said. During that week in July, the county’s oldest homicide victim was 48: Sylvester Darell Barker was stabbed around dusk on July 3 as he walked from a store to the Compton home he shared with his mother. 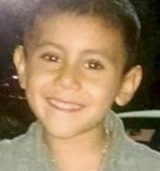 The youngest was 4-year-old Salvador Esparza III, who was on the porch of his mother’s boyfriend’s home in Altadena on July 6 when he was hit by a bullet meant for another person. Fourteen of the 19 killings involved gunfire. Two people were stabbed to death. One was beaten, one strangled and the county coroner has not made an official cause-of-death determination on another. Four were women. At least four were homeless. Five were black, two white and one Asian. The remaining 11 were Latino. Two people were shot while riding bicycles. Four were shot in cars, including Margarita Rosas, a Cudahy woman who was sitting with a co-worker in the front seat of her car outside his home, and Victor Alfredo Garcia, a 23-year-old El Monte man who was shot on his way home from work in an apparent road rage incident while his younger brother was driving beside him. The two Latinos killed by police increased the total of officer shootings to 19 for the year in L.A. County. Victor Vidal Sigala, 19, tried to rob an off-duty Los Angeles Police Department reserve officer inside a Covina restaurant July 6, said Covina Police spokesman Sgt. Gregg Peterson. The next day, Vinson Lee Ramos, 37, ran at Bell police officers with a knife after telling them to shoot him, sheriff’s homicide Sgt. Bill Cotter said. “We can talk all day about the dynamic of it all, but with a guy like this, he went out and forced these three officers to protect themselves because he decided he wanted his life to end,” said Cotter, whose team is investigating the Ramos shooting. Of the 19 deaths, three cases have resulted in murder charges. Oscar Rodriguez Jr. is accused of beating and strangling his girlfriend, Nancy Molina. Nicholas James Bowling is accused of strangling Franklin Murrell Rogers, with whom he’d been romantically involved. And Abdulla Tario Camran is charged in the death of Joie Nicole Kinney, whose body was found in a West Hollywood dumpster July 6. In the other cases, suspects — when there were descriptions — were men and often the same race or ethnicity as the people who were killed. In Compton, however, witnesses said two Latino adults attacked and stabbed Barker, who was black. 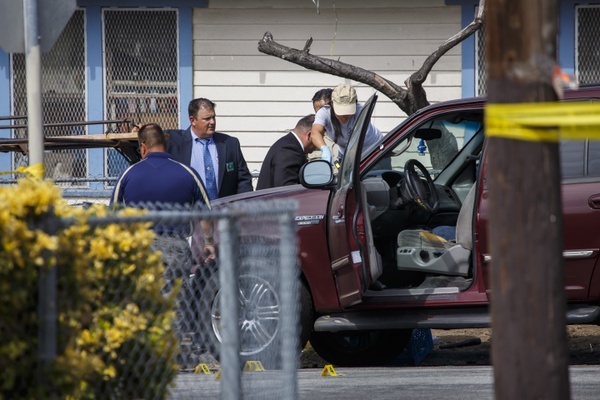 Also in Compton, Antonio Lopez, who was Latino, was shot in the back July 6 by a man witnesses described as black. Lopez, 31, was the youngest of seven siblings, a single man beloved by his 17 nieces and nephews, his sister Lourdes Lopez said. Their father lives in Mexico now, and the family met with him in Tijuana over the weekend to break the news that his youngest child had been killed. Lourdes Lopez said she always worried about her family’s safety in Compton — she moved her children to Bellflower several years ago, where she feels safer. But her brother was shot as he was walking from the store to his friend’s apartment across the street, and investigators have no clear motive in the killing. Photos: (Top) Authorities investigate in Altadena after 4-year-old Salvador Esparza III was killed by gunfire. Credit: Marcus Yam / Los Angeles Times. (Second) Salvador Esparza III. (Third) Antonio Lopez. If the LA times has information about the immigration status of a victim or suspect, will that information be included in the story? Why or why not? Also, do authorities routinely include immigration status about suspects? — John Rafter July 24, 2016 at 8:26 a.m.
assistance with our quest for justice for our slain family members. us. America, we can do better. — Jose Love July 23, 2016 at 2:58 p.m.